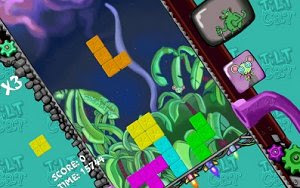 Ratsack Adventures is a freeware puzzle game that cleverly mixes two of the greatest classics in videogaming history: Tetris and Lemmings. It looks great and plays even better, with a multiplayer co-op mode for those who want to challenge a friend in the same PC. The goal of the game is to make points by aligning full rows or helping the mice reach the exits. The catch? By rotating the pieces we also rotate the entire screen, adding an extra layer of strategy to the game. There’s also a separate puzzle mode in the best tradition of Lemmings.